M·A·C and the legendary Mariah Carey collaborate for a limited-edition collection wrapped up in luxurious packaging detailed with silver glitter and champagne gold accents plus Mariah’s signature. Mariah Carey is an American singer, songwriter, record producer, and actress. She is one of the best selling music artists of all times, having sold more than 200 Million Records world-wide. M.A.C or Make-up Art Cosmetics originally founded in Toronto, Ontario Canada, was initially meant for makeup-artists only. But with time, the brand became a global success and is now available to make-up enthusiasts all over the world. So, imagine, when, one of the most coveted brands comes together with one of the most famous popstars of the century…the result is pure Luxury and chic. This M.A.C * Mariah Carey Range was launched in the year 2016, but was available in India only, by the beginning of 2017. The packaging is at par with the Impeccable glamour & glitz of the popstar, the epitome of ultimate luxury & bling, as ever. In fact, the packaging was the main reason I wanted to get this Eyeshadow quad, so bad. The outer carton is half Gold-half glitter, which is to die for. Like Love at the first sight…Duh.. !! ❤ Very festive, of course keeping in mind the time it was launched (Dec 2016). 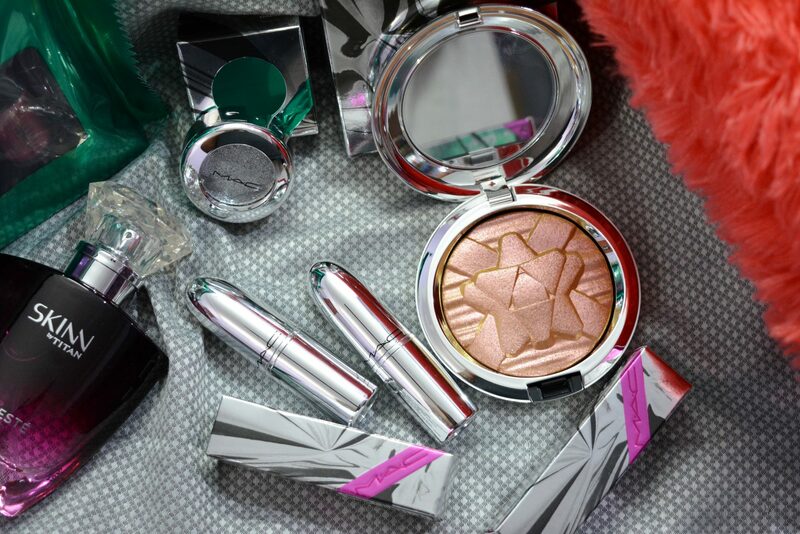 Seriously, one of the most gorgeous packagings from M.A.C, Everrrrr….!!!! While these were limited edition, one can find these on M.A.C Outlets globally, or amazon and other online retailers..(if in Stock, that is).